North Carolina based Mojo Musical Supply™, a leading provider of vintage amplifier and guitar parts, recently contributed some of their guitar pickups for the world's largest guitar, which is displayed at an exhibit by the National Guitar Museum. The world's largest guitar is 43.5 feet long, weighs more than 2000 pounds, and is a perfect scale model of a Gibson Flying V. But the one key ingredient that that won this guitar a Guinness Book certification as the world's largest guitar is that it is "playable." And what makes it playable? Mojotone® pickups from Mojo Musical Supply™ in Burgaw, North Carolina. The guitar is currently on display at the Carnegie Science Center in Pittsburgh, PA as part of an Exhibit called "GUITAR: The Instrument That Rocked The World." Every day hundreds of adults and children strum the 20-foot long thick wire strings to hear the sound produced by this enormous instrument. And it is a huge sound, thanks to Mojo Musical Supply's own custom-wound pickups. The unique 24-inch pickup on the giant guitar, which features six standard-sized guitar six pickups--one for each string--was requiring frequent replacements. "The giant guitar works like a regular electric guitar, so it requires wound pickups," says HP Newquist, executive director of The National GUITAR Museum (NGM), which owns the Exhibit and is touring it around the country. "But we ran into one of two problems with all the pickups we've tried: pickups with great fidelity weren't always constructed with materials that would withstand the environment, and those that were heavy-duty barely produced an acceptable sound. We found the best of both worlds at Mojo Musical Supply™. Their pickups have incredible sound and they are extremely durable." The Tele-style pickups were custom-wound at Mojo Musical Supply's headquarters in North Carolina and sent to Carnegie, where technicians replaced all the giant V's previous pickups. 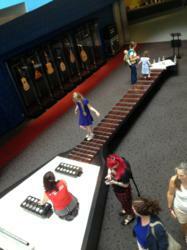 The world's largest playable guitar, complete with Mojotone® pickups, is on display at The Carnegie Science Center in Pittsburgh through September 30. From there, it heads to Virginia, Massachusetts, Idaho, New Jersey, and other states across the country. For complete information about all of the innovative music products that Mojo Musical Supply™ offers, visit their website at http://www.mojotone.com. Mojo Musical Supply™ has been in business for over 18 years as an amplifier cabinet manufacturer and amplifier parts supplier. Through the years, the Mojotone® line has grown to include all parts of the vintage, boutique and current production tube amp market. In addition, Mojo offers a complete line of guitar parts, pickup parts and guitar restoration supplies - including their own line of Mojotone® Custom Wound Pickups and a Signature Series featuring pickups designed by renowned techs, Lee Dickson and René Martinez. Having both East and West coast manufacturing centers, Mojo Musical Supply™ builds cabinets for over 100 boutique amplifier companies and routinely ships over 1,000 cabinets a month. Their quality is unsurpassed and their experience in guitar amplification, technical design, and customer dedication is outstanding. Mojo Musical Supply™ is committed to the highest standards of integrity, excellence and performance in dealing with both their client companies and individual customers. For more information visit their website at http://www.mojotone.com.